Free of charge: for EU citizens under 18 years old. Meeting with your private guide by the entrance of Porta Marina Superiore. 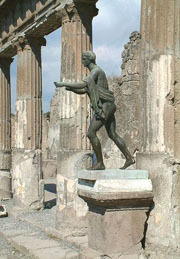 Enjoy a a great two-hour private visit with a professional English-speaking guide in the ancient Pompeii. Today Pompeii is chocked with over 3 million visitors every year: only by escaping the hordes and lingering along its silent streets shown by your guide, you can truly fall under the site’s spell. On a quiet backstreet, all you need is a little imagination to sense the shadow palpably filling the dark corners, to hear the ancient pipe´s falsetto, to envision a rain of rose petals gently covering a Roman senator´s dinner guests. THIS TWO-HOUR VISIT IN POMPEII RUINS COSTS EUROS 150. THE ENTRANCE FEE IS NOT INCLUDED. It is advisable to check with the Tredy Company the availability of your private guide and the best moment of the day to avoid the thousands of visitors who go to Pompeii from cruise ships..